A Not-Guilty Verdict Absolves Border Patrol Of Cross-Border Killing A Border Patrol agent was found not-guilty of involuntary manslaughter, raising questions about when and where use of excessive force is allowed in defending the U.S. border with Mexico. The border fence separating Nogales, Ariz. from Nogales, Sonora, Mexico. 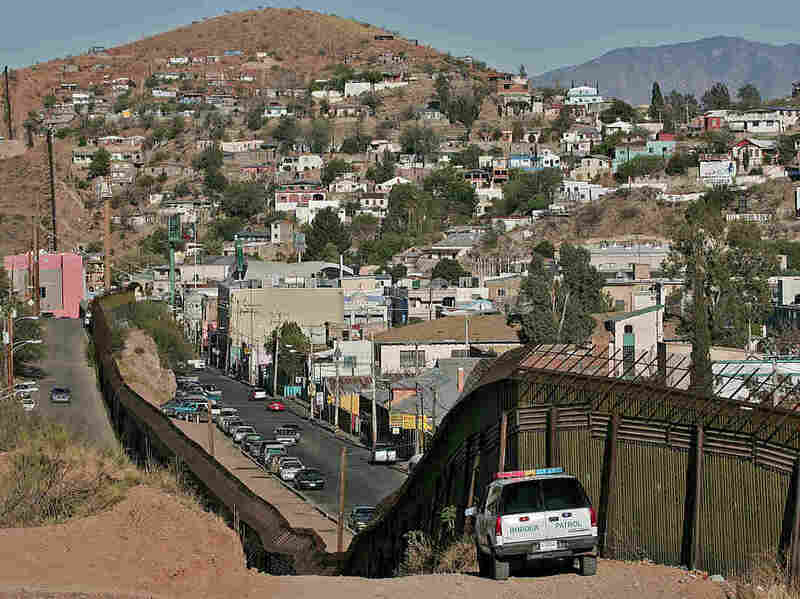 In 2012 a Mexican teenager was shot and killed by a border patrol agent shooting through the fence. Last week, the agent was found not-guilty of involuntary manslaughter. 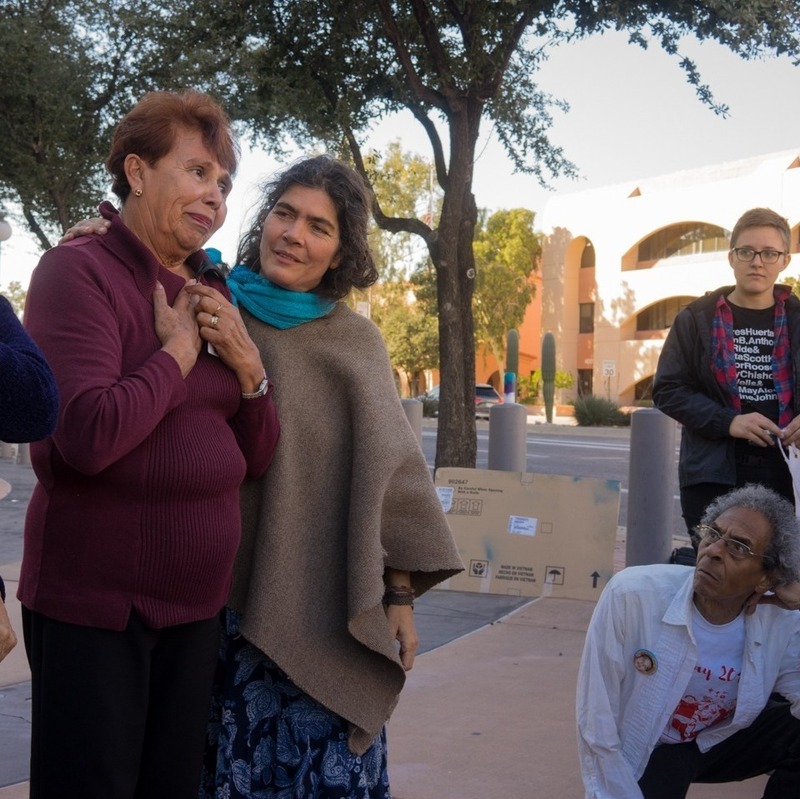 Last week in Tucson, U.S. District Judge Raner Collins announced to a silent courtroom that Border Patrol Agent Lonnie Swartz had been found not guilty of involuntary manslaughter for the killing of Jose Antonio Elena Rodriguez. In October of 2012, Swartz shot 16 rounds through the border fence from Nogales, Arizona, into Nogales, Sonora, Mexico. Ten bullets were found in sixteen-year-old Elena Rodriguez' back and head. Swartz's defense argued that Elena Rodriguez was throwing rocks, and that agent Swartz feared for his life. After the verdict was announced, a grey-haired man stood, "This is a miscarriage of justice!" shouted Richard Boren, head of an advocacy group named Victims of Border Patrol Network. And then, "Tomsheck should have testified!" referring to former Customs and Border Patrol Internal Affairs Officer James Tomsheck, who reported to multiple sources that he saw a clear video in which Jose Elena Rodriguez was not throwing rocks, as the defense alleged. Court marshals ushered Boren out of the courtroom, past Elena Rodriguez' mother waiting outside. She didn't want to be in the courtroom just in case this non-guilty verdict was reached. The victim's grandmother though, Taide Elena, sat in the first row, stoic until the last jury member left the room. When the judge too had left, supporters surrounded her, and tears began to stream down her face. The victim's grandmother, Taide Elena, outside of the courtroom with supporters. She led the fight to put Border Patrol Agent Lonnie Swartz on trial for killing her grandson, Jose Antonio Elena Rodriguez. Mrs. Elena has been fighting for justice for her grandson's killing for six years. He was like a son to her, she testified. Taide Elena lived mostly on the U.S. side of Nogales, cleaning houses to support Elena Rodriguez and his family back in Mexico. The morning after he was killed she called the man whose home she'd cleaned for some twenty years, former Nogales, Ariz. district Judge, Roberto Montiel. With that call began what has been an unrelenting legal battle: two and a half years for Swartz to get indicted, another two to go to trial for second-degree murder. He was acquitted of that charge in April. This last trial for manslaughter has been yet another month in court reliving every detail of her grandson's gruesome death. Montiel has been supporting her and the family all of that time, "Of course I am, Taide was with my mother when she died, she's always been part of the family," he said. Though the verdict was disheartening to the family of the victim, the fact that there has been a case at all was extraordinary. The Guardian has documented 97 fatal encounters over the past fifteen years, yet this trial is only the third time that a Border Patrol agent has faced a jury for a killing committed while on-duty. The first was Agent Michael Elmer who was charged with second-degree murder and obstructing justice. He was acquitted in 1992. The second was agent Nicholas Corbett who witnesses say shot Francisco Javier Dominguez-Rivera execution-style in the desert. He claimed, as did Agent Lonnie Swartz, that the victim was throwing rocks. Two trials ended in hung juries and prosecutors dropped the case. The Elena Rodriguez case has haunted James Tomsheck since he left CBP in 2014. He says it is one of the most clear-cut and egregious excessive use of force case he witnessed at the agency. When he was at CBP, he filed whistleblower complaints about the agency, and eventually resigned. "This tragic incident is an example of an irresponsible use of lethal force. Had it occurred in any American city it simply would never have been tolerated," he says. Tomsheck believes that the Swartz trial points to a larger pattern of abuse within agency. A report by the American Immigration Council found that over 95 percent of alleged misconduct complaints filed internally at CBP between January 2012 and October 2015 resulted in "no action taken." In 2014, the CBP itself released a a critical report of misuse of deadly force specifically in the case of rock-throwers and moving vehicles. After initially refusing to make the report public, the agency eventually did, along with updating their handbook to state: "Excessive force is strictly prohibited." But when is use of force excessive? In Swartz's case, the prosecutors asserted that was for this jury to decide. Through their not-guilty verdict, they have made clear that the killing of Jose Antonio Elena Rodriguez was not an excessive use of force in their view. Arturo Del Cueto, Vice President of the National Border Patrol union, agrees: "We've always held our agents accountable when they did something wrong," he says,"In a case like this we've always backed up our agents when we believe they did the right thing." James Tomsheck is upset but not surprised to learn of the verdict. "Most CBP officers and Border Patrol agents are high integrity law enforcement professionals," he says, "who will not let this verdict influence how they conduct operations in the field." He warns that some Border Patrol agents and CBP officers, however, "will unfortunately see this verdict as giving them a wider range to engage in activities with excessive use of force, an unfortunate consequence for people living in border communities." That is an upsetting consequence for Taide Elena, who wants nothing more than justice for the death of her grandson. The day after Day of the Dead earlier this month, Mrs. Elana tidied up her grandson's grave. "This is the comfort the living remain with," she said in Spanish, "to bring their deceased ones flowers and candles." She was a day late to the remembrance because of the trial. She never missed a day in court during this trial or the first, which she often came to alone, or driven by her friend and client Roberto Montiel. Elena Rodriguez's mother only was granted permission to come to the U.S. for the retrial. That was the first time she'd set foot on U.S. soil. While the criminal case for Jose Antonio appears to have ended, the family still have a civil case pending before the Supreme Court. The American Civil Liberties Union is supporting them in what could be the first time an agent held liable for monetary damages for a killing outside of U.S. territory. While Taide Elena's great grandchildren played around her, she stared off into the distance towards the jagged border fence below. "Pues, La esperenza muere al ultimo, verdad?" she said, "Hope is the last thing to die."